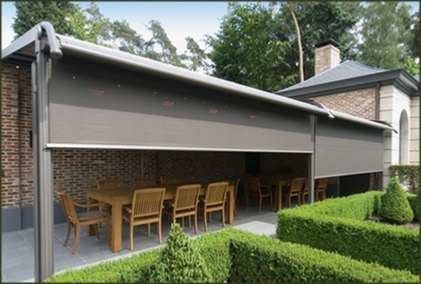 An externally fitted VertiTex awning offers sun protection, an anti-glare screen, wind protection and privacy all rolled into one. The fabric and technology are both housed in one miniature cassette but are still capable of shading large areas. The VertiTex is available in both wire and rail guide versions, together with a range of fabric colours and qualities to suit your requirements. The VertiTex with rail guide is ideal for windows that are often exposed to moderate wind load. The VertiTex with wire guide is the optimal solution if you desire a particularly light and airy outer appearance but is also suitable for moderate wind load. It has the profile of a bank card; with a cassette height of between 74mm an 86mm, the VertiTex cassette is especially small and discreet.